Caving...Just Like Cave Diving But With More Pain! From time to time I have to travel for work and ultimately I leave on Sunday. This usually leaves me in the position of not being able to dive on Saturdays. Lucky for me we have some great friends at USF Karst (Jason, Grant and others) as well as Tom and Robert (TRUE Karst Hounds) that don't mind taking us to see some great dry caves. We enjoy it almost as much much as Daisy does. Daisy is our beautiful Walker Treeing Coonhound seen at the bottom of the picture. She is trying very hard to be a good karst hound! Robert has taken us under his wing and has been teaching us the finer arts of belly crawling and rope work. In return, we have tried to show Robert some interesting wet caves and help him in the fine art of pulling and gliding. It really is a great partnership! To make it even better, we are trying to get Tom to take Cavern and Intro with Jim Wyatt. Tom is simply an unbelievable source of information from caves to karst to flora and fauna. Click here to take a look at some of his pictures of the Florida underground. Also, take a look at the some of the amazing formations that have been unearthed by mining operations. It is truly amazing, while at the same time horrifying, to see clear calcite formations littered on the ground. The North Florida caves are starting to show some improvement. The common systems (Peacock, Little River, Cow, etc.) are improving but are still not diveable. However, if you need to get wet, Ginnie is still pumping clear water and Madison has started to improve. 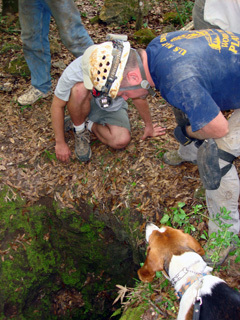 Central Florida caves such as Wayne's World, Eagle's Nest, etc are also diveable. Those North Florida systems should be opening up within a month or so. Systems up in the Panhandle seem to be doing well and lets hope that is the case. We are taking a trip up to Marianna next weekend so we will get see for ourselves. Although I have been really looking forward to that trip, I would rather be in Weeki Wachee. I have had my fingers crossed all spring that the flow at Weeki Wachee would drop like a rock so we can get back in there; only time will tell. As of today the flow is 117 cfs which is still too high for safe diving operations. If you haven't already, sign up for the 2008 NSS CDS Annual Workshop. You can find more information by clicking here. The NACD -- Another Reason to NOT be a Member! What Does the NACD Have to Hide? Why Would Anyone Explore Caves?